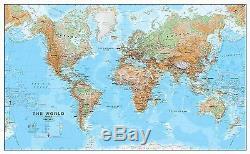 World Wall Map Physical Poster Print Art Map, Size & Finish Options. World physical wall map is a high quality map which is a fantastic representation of the world's physical terrain. Map details: Our physical world wall map features the natural terrain of the land as well as the different physical areas. Country borders and major cities are shown. The map's key helps to identify the different land terrain. Map Uses: One of our most popular world maps - a great centre piece for any school room or office. We have a range of different finishes and sizes to choose from. Please select from the dropdown option at the top of the lising. Please read below for a short description of each finish. Paper Your map is printed onto 110 gsm paper and is left unfinished. Paper with Front Sheet Lamination (Laminated 1 Side) Your wall map will be finished with a front sheet lamination process. Front sheet lamination gives the map a write on wipe off finish, meaning that, using the appropriate pen (for whiteboard use) or Chinagraph pencil any writing on the map can be wiped off with a damp cloth. Silk Art Paper (170gsm Silk) Our Silk Art paper is a superior colour reproduction finish and provides high quality photo results. The 170gsm paper is coated in a smooth silk material, combining strength and durability. Matt Art Paper (300gsm) Our Matt Art paper is a superior colour reproduction finish and provides high quality photo results. The 300gsm paper is uncoated for a crisp and modern appearance. Laminated Your wall map will be finished with an encapsulation process. Encapsulation means that the maps are heat sealed between two sheets of industrial quality film. Please note that the edges of this map are not sealed. Encapsulation gives the map a write on wipe off finish, meaning that, using the appropriate pen (for whiteboard use) or Chinagraph pencil any writing on the map can be wiped off with a damp cloth. Pinboard Laminated and mounted onto foam centred board for rigidity, appearance, and the ability to be tacked with pins. Supplied laminated mounted onto Kapa mount foam centred board. Fixed to the back of this board is a hanging mount, allowing you to easily hang your map. Canvas Canvasses are wrapped around a quality wooden frame to stretch the material to perfection. Hand made by us with great care. Supplied with corner wedges for the re-tensioning of your canvas. Individually bubble wrapped and carefully packed in a sturdy, custom made box for the total protection of your print. Acrylic Directly printed onto acrylic giving a translucent finish. Acrylic is a high class finish but really best for a light, neutral background wall colour. Each panel arrives with pre drilled holes in each corner and 4 aluminium wall fixings to enable you to attach the artwork to the wall of your home, office, shop, bar or hotel. Laminated with Aluminium Effect Hanging Bars We laminate your map and supply with a set of brushed aluminium effect hanging bars. These allow you to hang the map using nails whilst adding a stylish finish. Roller Blind System Your map is supplied laminated and fitted into a roller blind system. This enables you to roll the map up and down as required. Perfect for rooms with little space. This finish is especially popular with schools. Snap Frame Finished with a stylish aluminium map frame. Snap frames have mitred corners and create a neat uncluttered frame. The frame is spring-loaded and can be opened with the fingertips. Screws and Wall Plugs included. Wood Frame Real ayous wood 20mm wide with perspex glazing. Laminated, Pinboard Mounted and Framed Print is laminated, mounted onto Kapa mount foam centred board and framed in PVC 20mm wide. Ready to be hung on the wall of any office or branch and will be supplied with a hanging kit. You are also able to use your map with drawing pins creating a useful operational tool. Magnetic Board & Frame For this option, your map will be supplied laminated, mounted on a metal backing and framed in a stylish brushed aluminium frame, with a 16mm edging. This option is our premium finish and is increasingly becoming more popular with our customers for use as an operational tool. Ready to be hung on the wall of any office or branch, your map will be supplied with a hanging kit. Rolled Canvas Your map is printed onto canvas and delivered rolled in a tube. Laminated with Wood Hanging Bars Supplied with real wooden hanging bars which adds to that vintage or classroom style. This is a handmade wooden hanging system made from four wooden strips. The top and bottom of your print is pressed between the two wooden bars which are screwed together. We also supply two sawtooth hangers which allows you to fix the print to the wall. Pinboard Mounted onto foam centred board for rigidity, appearance, and the ability to be tacked with pins. Supplied mounted onto Kapa mount foam centred board. Pinboard Mounted and Framed Mounted onto Kapa mount foam centred board with a PVC frame 20mm wide, with a choice of brushed aluminium, dark oak or black colour. Our customer services team will provide the information you need. For this reason you may want to consider using a courier or registered post to return items to us. If your product does arrive by courier please ensure you inspect goods for damage prior to signing for them. If the packaging or product is damaged please do not accept it from the courier or alternatively please sign for the item as damaged. Please note: to check the actual map for damage you will need to remove it from the package. Unfortunately occasionally damage occurs to the map when the packaging looks in good condition. The item "World Wall Map Physical Poster Print Art Map, Size & Finish Options" is in sale since Monday, August 21, 2017. This item is in the category "Art\Art Posters". The seller is "mapsinternational" and is located in Oxfordshire. This item can be shipped to United Kingdom.